I have spiders living in both mirrors on the 100HP. I’ve tried everything to encourage them to vacate, but they won’t go and they don’t seem discouraged at all that I wipe the webs away each day. I’m racing at MIRA tomorrow. 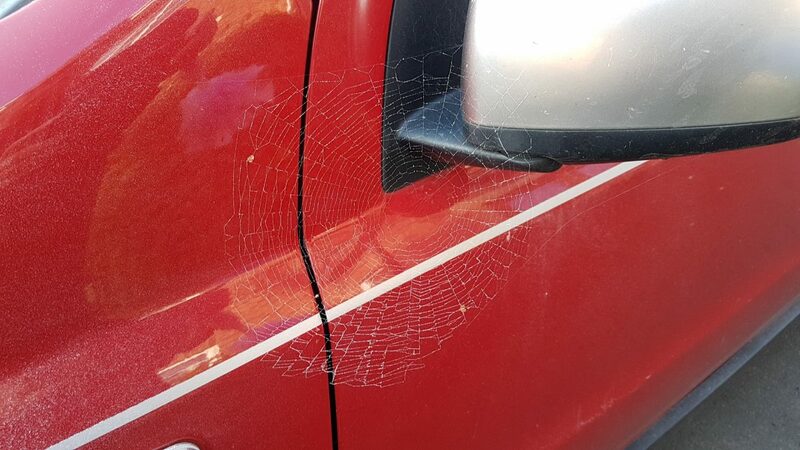 I washed the car this afternoon but perhaps I’ll leave tomorrow’s webs in place and see if they survive the meeting. It’s a round of the HSA championship and I’ve just looked at the championship results. I’ve only done three rounds and am 57th! I’ve entered the last two rounds at Curborough but this will be my worst season ever. The class record for tomorrow is 61.42 set by R.Stephens in a Peugeot 106 Rallye. The weather forecast is rain so I’m not too hopeful of bagging many points. I am the only entry in the up to 1400cc roadgoing class so the organisers (Midland Automobile Club) have merged it with the two litre roadgoing class. My own personal challenge will be to try to beat one of those guys. After putting my new wheels on the Toyota GT86 the tyre pressure light was permanently on because I had forgotten to get the Tyre Pressure Monitoring System valves removed from the old wheels and fitted to the new ones. I was going to ignore it but it’s an MOT failure if you have a warning light and it’s on so I got that done today. However, the tyre fitter broke the unit on one of the old wheels getting it off. £90 for a new one! Plus fitting. Anyway the light is now out. The guy at the tyre fitting place thought I’d have to know the position of each of the old wheels when they had last been on the car (which I didn’t). I phoned Toyota and they said they are a matched set but don’t match particular wheels and the ECU would ‘learn’ their positions anew. So we just put them into random wheels and pressed the tyre pressure reset button. If anyone needs more info about Toyota TPMS see here: How TPMS works.